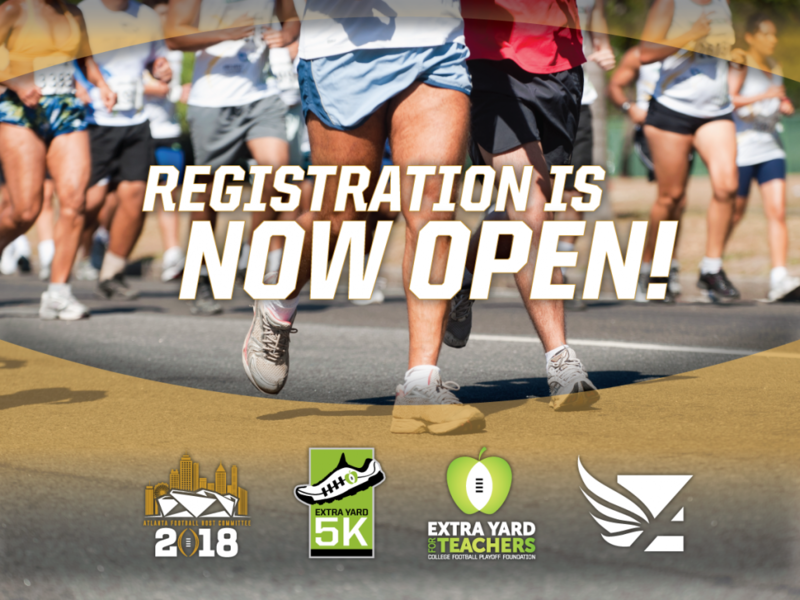 ATLANTA (June 27, 2017) –The Atlanta Football Host Committee (AFHC) and College Football Playoff (CFP) Foundation today announced a partnership with Atlanta Track Club to host the Extra Yard 5K, the official road race of the College Football Playoff. All proceeds benefit Extra Yard for Teachers, the CFP Foundation’s primary platform that elevates the teaching profession by inspiring and empowering quality teachers. The race, scheduled for Sunday, January 7, 2018, at 8 a.m., starts and finishes within the Championship Campus footprint in downtown Atlanta. The 5K is one of many community events leading up to the College Football Playoff National Championship on Monday, January 8, 2018, at Mercedes-Benz Stadium. The 5K includes live entertainment, activities with race sponsors and a post-race awards ceremony where the top overall male and female finishers will each win two (2) tickets to the College Football Playoff National Championship.